Work for Four Eyes Surveys? Learning about Four Eyes Surveys? "A smart survey platform "
Authentic surveys are not easy to get. A four eyes survey site is giving you the opportunity to create and send organized surveys that can give a clear idea about that particular subject. This survey site is so flexible to use and one can pick its survey topic from the library or can choose own custom subjects. You can get a clear view of an organization by analyzing their surveys. One can easily adjust their survey questions according to their need and any hard inquiries can be arranged simply by four eyes. It provides you the authentic outcome within a short period of time. So if any organization needs any overviews, simply they can choose four eyes to get their job done in an excellent way. Undoubtedly four eyes is a wonderful survey site but it has some downsides too. They are not always likely to pick up a phone call when their customers need to talk to them. Besides, using four eyes you have the option to customize your question that can lead your answer partially biased which may not represent an organization’s overview clearly. Business can learn a lot and can get a clear perception of an organization if they use four eyes data in a proper way. I would highly recommend individuals to give it a try as it saves your organization’s time and will give you an authentic result within a minimum period of time. A meaningful survey analysis can help you to take the unerring decisions for your business that may led you to do more profit in future which can give you business a stable position too . So whenever in doubt to take the right decision for your business, do a survey, know the public opinion and you can invest more wisely and precisely. "An authentic survey site for your organization"
Four eyes is a useful survey site that saves time and provides all relevant information about the organization. This site provides reliable overview one can trust easily. Customization of survey questions is possible so one can easily deal with it without any complexity. Four eyes is giving you the flexibility to write, record and can delete your questions according to your need and at the same time you are getting the facility to pick up a theme from the library or can design your own custom themes. One of the best parts regarding this site is it’s easy to navigate and ensures you to provide authentic information in a short period of time. So if your company needs overviews, four eyes can be the best option to pick up. Undoubtedly it’s a wonderful app to get clear overviews of a company but what I have found that sometimes their results are partially biased. They are not always so comfortable to share those overviews which can give negative impression about the organization. It would be a wise decision to choose four eyes to do their surveys as it ensures to provide you a clear and whole overview of a particular subject. This site will spare your business time and will help you to take important business decisions without much of stress. This data mining engine can make your life a little easier by sending beautiful surveys and can assist you to choose the right decision for your business. When you are in a dilemma what to do and what to not, this survey sight can work as a savior by providing you all essential information which will help you to take the exact decision for your business. "An Intuitive platform to gain Insights"
I like the whole new concept of this program.it is an application which is completely based on knowledge. Easily one can drag and drop questions to build their own survey. There are 24 types of questions any one can ask, all of them are fully editable. Write, record and even any one can delete their questions easily. Either one can choose theme from the library or can create their own custom themes. The data mining engine of this program is so powerful that it finds insights of the topics where other software will just spew out numbers. The things that i dislike about foureyes survey is that it may not always feel encouraged to provide accurate, honest answers. In my point of view respondents may not feel comfortable providing answers that present themselves in an unfavorable manner. Survey question answer options could lead to unclear data because certain answer options may be interpreted differently by respondents. I would recommend people who wants to survey about the new topics and gather knowledge to improve their business. They can survey on any topics and give their opinions instantly. People with thirst of knowledge and willing to gather details about new things, will find this platform very much knowledgeable. This platform helps you become smart and brilliant with each survey you perform. With the help of this survey platform a lot of business problems can be solved such as, if you are facing some difficulties with something that you have never heard of, you can simply question it on this site and you will have your answer instantly. 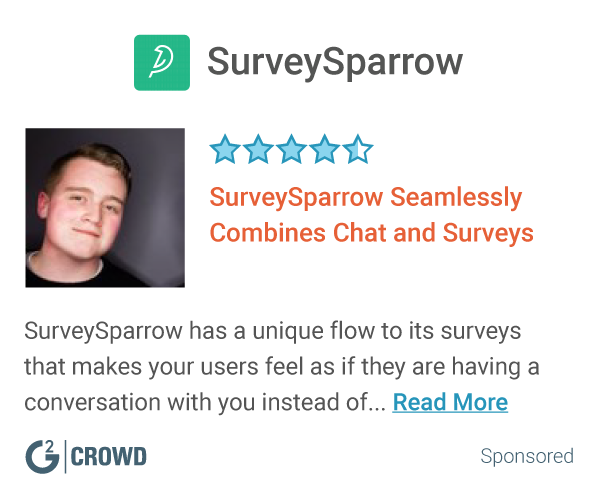 It is so much simple and fun to use that you can even customize your questions with other options and place it wherever you want.The best part is you can survey it for free. "A clairvoyance alternative to know person's feeling "
Four eyes is a reliable overview stage that can give you a reasonable view about the overall public. This application is so easy to use and in the meantime it spares the season of clients while they are doing their reviews. Client can re-try the page and the region headers. Inquiries are adjustable, so one can do their claim study without much anxiety. This study site is giving you the office to compose, record and even a can erase your inquiries as indicated by your need what's more you can pick subject from the library or can make your own custom topics. The best part about this study site is they are subject to give you valid outcomes in a base day and age. So request should be possible essentially utilizing this four eyes stage. Four eyes has a few drawbacks like some overview address answers may dependably not give you the correct information or might be sure outcomes can be translated contradistinction by answered. Now and then this overview destinations results could be marginally one-sided as far as introducing their negative sides as they are not generally agreeable to share any data which may show them in a negative way. you need to know open decision, an appropriate study can give you an unmistakable vision with respect to this matter. So it will be simpler for your business to take the rectify choice. So in this way it can help your business to develop brisk. "An intuitional option to know individual’s opinion"
Four eyes is a trustworthy survey platform that can give you a clear view about the general population. This app is so user friendly and at the same time it saves the time of users while they are doing their surveys. User can redo the page and the area headers. Questions are customizable, so one can do their own survey without much stress. This survey site is providing you the facility to write, record and even a can delete your questions according to your need and besides you can choose theme from the library or can create your own custom themes. The best part about this survey site is they are liable to provide you authentic results in a minimum time period. So inquiries can be done simply using this four eyes platform. Four eyes has some downsides like some survey question answers may always not give you the exact data or may be certain results can be interpreted differently by answerer. Sometimes this survey sites results could be slightly biased in terms of presenting their negative sides as they are not always comfortable to share any information which may present them in a negative manner. Four eyes can make your life better and simpler. It can be a life savior of your business too. For instance, if your business is planning to launch a new product and you want to know public choice, a proper survey can give you a clear vision regarding this matter. So it will be easier for your business to take the correct decision. So in this manner it can help your business to grow quick. "A basic answer for legitimate overviews "
Four eyes surveys studies have spared my time and gave me a reasonable thought regarding all inclusive community. I can without much of a stretch add or drop inquiries as per the need of my review. It's flexible to the point that one can without much of a stretch compose record and even can erase it effectively. It has given me the opportunity to pick topic from library or one can custom his/her own subjects. This site has given me the flexibility to rearrange any hard inquiries as indicated by my motivation. I can do my overview in less time with a certification of getting a sterling outcome. So it's a best choice for an organization to do their overviews on the off chance that they need greatest information. The things I despise around four eyes reviews is at times their studies results are mostly one-sided. They are not generally agreeable to give data which is negative to them. Some overview address answer alternatives may prompt indistinct information and some can be translated in an alternate way. I would propose individuals to pick four eyes surveys on the off chance that they need to study about new subjects and gather data to maintain their business well. They can overview on different points which can spare your profitable time. This stage will help you to assemble increasingly data which you requirement for your business and can help you to take the correct choice for your association. It can make your life simpler. You can take incite choice relying upon their reviews. For example, if your business is confronting any troubles and u need to deal with it, essentially you can utilize this site to find your solutions. This stage is so natural to utilize that you can redo your question contingent upon your circumstance. "A survey site one can trust"
I can freely rely on four eyes surveys to get the relevant knowledge for the company. Their guileless question patterns make the surveys easier. One can alternate their survey questions according to their needs. Four eyes surveys always try to provide authentic results in a minimum time period. Intricate inquiries can be spontaneously executed on the grounds that are made by information nerds. Any hard question can be answer simply using four eyes surveys. What I dislike about four eyes surveys that sometimes they are not so responsive to attend a phone call. Better they should use apposite response machine to get a call. They may not always support you to provide exact answers which are unfavorable for them. Four eyes surveys can give you exact knowledge on any subjects instantly. They can help you with any knowledge you need for company’s betterment. Their sterling and instant service is truly praise worthy. So I would definitely suggest people to their surveys from four eyes if you want to get the best results. Four eyes surveys can help you to take your business decisions easily by their genuine surveys. You can customize your questions with other options and place it wherever you want. Corporate officials can save their valuable time if they choose four eyes for their survey purpose. "A simple solution for authentic surveys "
Four eyes surveys have saved my time and gave me a clear idea about general population. I can easily add or drop questions according to the need of my survey. It’s so flexible that one can easily write, record and even can delete it easily. It has conferred me the freedom to choose theme from library or one can custom his/ her own themes. This site has provided me the freedom to simplify any hard questions according to my purpose. I can do my survey in less time with a guarantee of getting a sterling result. So it’s a best option for a company to do their surveys if they want maximum knowledge. The things I dislike about four eyes surveys is sometimes their surveys results are partially biased. They are not always comfortable to provide information which is unfavorable for them. Some survey question answer options may lead to unclear data and some can be interpreted in a different manner. I would suggest people to choose four eyes surveys if they want to survey about new topics and collect information to run their business well. They can survey on various topics which can save your valuable time. This platform will help you to gather more and more information which you need for your business and can help you to take the right decision for your organization. Four eyes survey can make your life easier. You can take prompt decision depending on their surveys. Such as, if your business is facing any difficulties and u want to sort it out, simply you can use this site to get your answers. This platform is so easy to use that you can customize your question depending on your situation. "Simple approach to know individuals' view "
I utilized the four eyes study to know the idea or perspectives of the general population effortlessly. For building a review I can without much of stretch intuitive inquiries. I can redo the page and the area headers. Complex inquiries can be effortlessly executed on the grounds that it is made by information nerds. My respondents were not being confounded in light of the fact that the question numbering is progressive. On the off chance that the rendition of my "extraordinary looking" does not coordinate with the interviewee then he or she can modify everything. In short a hard question can be made simple by utilizing the four eyes overview. I detest the four eyes study for different reason. For instance if there should arise an occurrence of individual meeting it costs more for each meeting than whatever other strategies. If there should be an occurrence of doing the review through phone I watched that many individuals are not willing to get the call and utilize the appropriate response machine to get the call. The innovation ending up plainly quickly. So it is seen that in the greater part of the spots they have their own particular answer machine. I would prescribe to various corporate officials to utilize the four eyes review. Since an official has a ton of duties in the association. They likewise need to know the audit of various level of individuals. They likewise need to persuade the senior officer. All things considered they can utilize the four eyes study. It can help them from different structures. It will spare their time. It is awesome looking. The senior officer can likewise tweak according to their decision. The corporate officials can utilize the four eyes review. So when they will utilize this strategy their time will be spared. Therefore they can without much of a stretch take a choice and actualize that choice for the improvement of the association. So the association will grow quick. I also use Survey Monkey but I think this one may be a bit more intuitive on how the layout works. I like that it gives you a preview as you go along. I really haven't discovered anything that I don't like at this point. Another option for creating surveys and it's free so others can use this a private option. It's easy to use and send a quick email for surveying the company. Even to create a quick yes or no poll can be done within seconds. Nothing, there's nothing to really dislike. everything is easy and straightforward. it helps with taking a quick poll for lunch choices, getting insights to how the employees are feeling. asking our employees how we can improve things. It can be used for a quick yes or no and for making larger decisions. * We monitor all Four Eyes Surveys reviews to prevent fraudulent reviews and keep review quality high. We do not post reviews by company employees or direct competitors. Validated reviews require the user to submit a screenshot of the product containing their user ID, in order to verify a user is an actual user of the product. Hi there! Are you looking to implement a solution like Four Eyes Surveys?